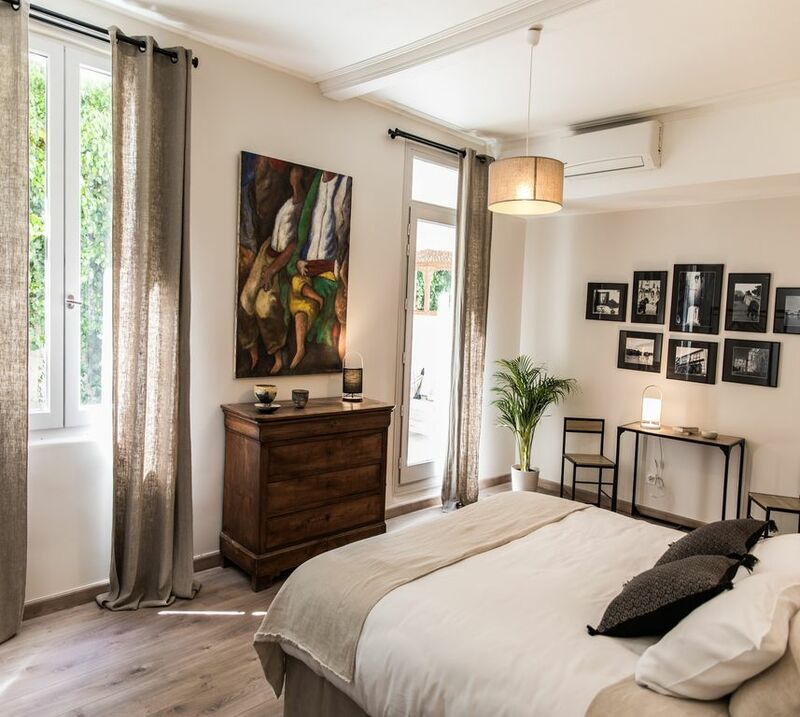 La Demoiselle welcomes you in the heart of Avignon just minutes from the Palais des Papes. The house is located between the charming Place des Carmes and the Place Pie lined with cafes, restaurants and its famous halls. With its linen-colored walls, cement tiles and typical Provence tiles, the Demoiselle boasts a contemporary and poetic style, tinged with a pinch of vintage spirit. Beautiful asleep, the house wakes up renovated in a frisky and trendy guest house. The rooms are equipped with comfortable beds, kingsize (180x200) with the possibility of separating them into twin beds (notify when booking). The bed linen is linen of good quality conferring a feeling of freshness in summer, and cozy warmth in winter. When Elisabeth first visited this small mansion, she was immediately seduced by her old-world charm, her potential and the backyard transforming into a secret patio. With his companion Christian, this place became the meeting point of their children living in Paris, Lyon, Berlin, Melbourne and Avignon. It's Violette, an avignonnaise of adoption, who will welcome you. Tourist guide in Provence, it will be good advice for your visits and excursions. With her son, Sasha, she brings a dynamic and friendly presence to the house. Because every moment can be an excuse for emotion, Violette and Elisabeth will share with you their art of living, with simplicity but also elegance. Because little things, a bouquet of flowers at lunch, a music in the background or a small drawing transforms a banal day into a symphony of small pleasures, we like to add the touch of pace that makes life less ordinary. The little tip to discover the secret alleys of Avignon and make the moment memorable. We are The Demoiselle. Together, let's cultivate the art of little things. A lovely guest house, with very helpful friendly owners, who went out of their way to welcome us to there beautiful home right in the center of Avignon. Highly recommend.